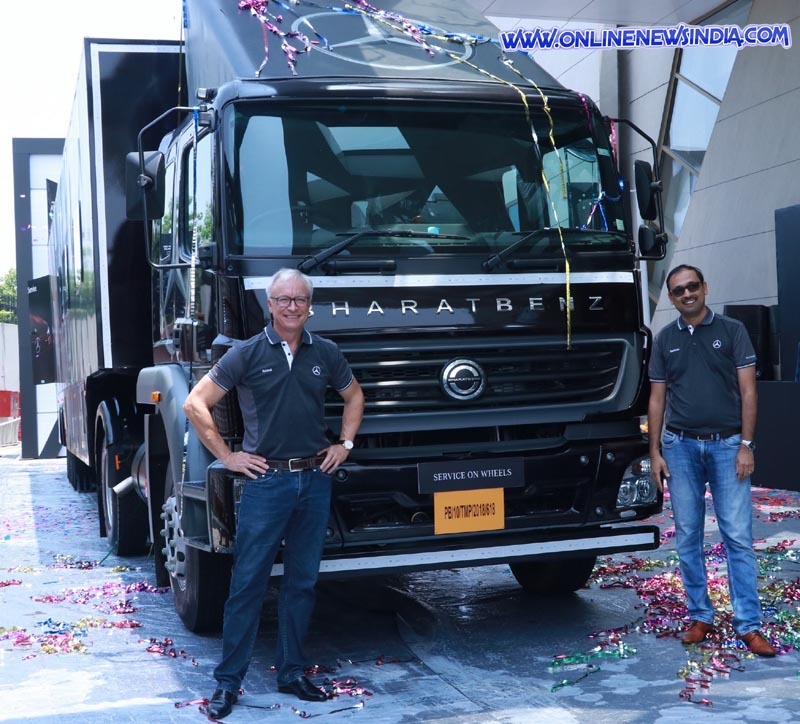 Ludhiana, July 18, 2018 (Rajinder Ahuja): India’s largest luxury car manufacturer Mercedes-Benz today announced the launch of yet another innovative customer service offering for its customers called ‘Service on Wheels’. This novel initiative comprises a service truck equipped with all tools along with professional service personnel to attend tocustomer cars, especially in Tier 2and tier 3cities where Mercedes-Benz doesn’t have a direct presence. On being notified, a mobile service truck will visit the customer’s area and carry out the inspection, repairs and service of the car, adding great value and convenience to the customers.This initiative is part of Mercedes-Benz’s hugely popular service differentiation strategy under the ‘My Mercedes, My Service’ umbrella, launched in July 2016. ‘Service on Wheels’ is a first-of-its-kind initiative in the Indian luxury car industry, which is highly customer-centric and tailor-made for the Indian market. This concept is a result of the Business Innovation project which is conceptualized by the employees of Mercedes-Benz India. It was launched by Roland Folger, Managing Director and CEO and Santosh Iyer, Vice President-Customer Service, Retail Training and Corporate Affairs, Mercedes-Benz India in the key market of Amritsar today.The Phase I of‘Service on Wheels’ will travel to 15 different Tier 2 and Tier 3 markets undertaking service related requirements of customers in the remaining months of the 2018. With a history of serving customers in India since the last 24 years, Mercedes-Benz is known to provide the best-in-class service to its patrons. ‘Service on Wheels’ is an easily accessible mobileservice centre for customers where a Mercedes-Benz dealership is not available conveniently. The technical team in the service truck inspects the car using a mobile lifting platform.Instances of the vehicle check comprises lights, windscreen, wipers, brake discs/pads, leaks, battery, etc. • Checking the condition of the axle, axle joints, suspension struts and springs. Specially trained service advisors, VPC technicians, sales advisors along with other support staff accompany the Mercedes-Benz ‘Service on Wheels’ truck at each visiting location. For more intense repair work including BandP works, the customer can also book workshop appointment at the ‘Service on Wheels’ by the Service Advisor. Additional elements of the mobile truck service include an exclusivelounge, where the customers can wait in comfort while the inspection of the car takes place.